Each year we look forward to the arrival of warm weather to Cape Cod. With it comes the opportunity to enjoy outdoor activities. 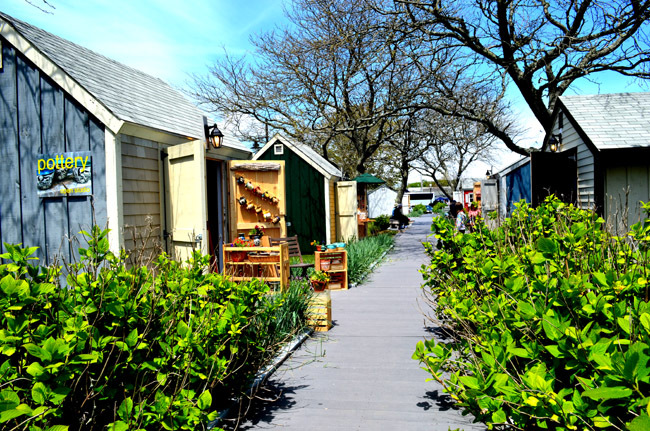 On a recent warm Sunday afternoon, we headed down to Hyannis Harbor to check out the HYArts artist shanties that are situated along the boardwalk on the waterfront. 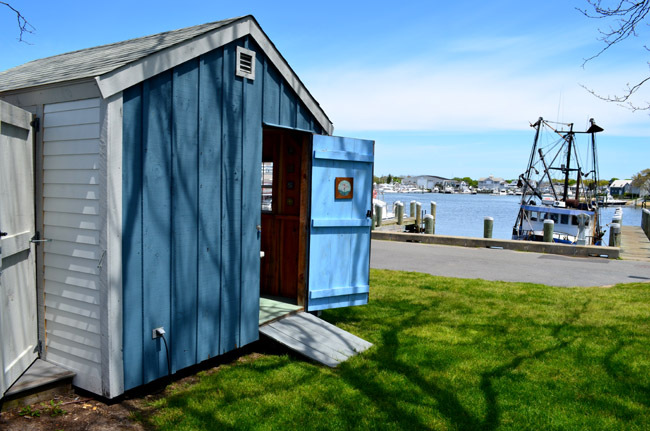 The small houses that are referred to as art shanties are moved to their seasonal location on the harbor in May. Artisans throughout the Cape are invited to submit an application to show their work for a specific period of time during the season. For this reason, any time you visit the area, there are likely to be different artists displaying their work. There is always something new to see, and everything is for sale. Painters working in acrylics, oils, watercolors, and pastels will be represented. There are photographers, jewelers, potters, wood carvers, fiber artists and artisans working in other mediums represented. During our Sunday visit, we had the good fortune to come upon Laurie Goldman and Mudlark Pottery. I was immediately drawn to her lovely pottery because it reflects the beauty of the marshes and beaches of the Cape. Her work is heavily influenced by her background in whale research as a nature writer. I especially liked her mermaid series. Laurie has recently published a book entitled Into The Field Guide - A Walk on the Beach. It is a wonderful guide to all things ocean and dunes. Although the books focus is on educating young people about the natural environment of the beaches, I loved it so much that I purchased a copy on the spot to keep in our little library at the inn. I think our guests will thoroughly enjoy it and it will be helpful to them in their beachcombing while they are visiting Cape Cod. This charming book is available on Amazon and is a great gift for anyone. 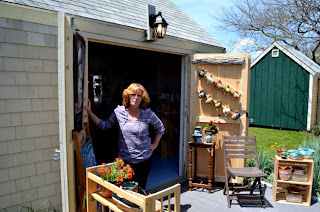 Laurie occupies one of the HyArts artist shanties on weekends during the spring and fall. surrounded by a number of seafood restaurants. Most of them have outside seating during the warmer months. What a wonderful way to spend an afternoon. There is ample paid parking available throughout the area. open during the month of September from 1-5 pm. The HyArts Shanties are made possible each season through the generous support of the Massachusetts Cultural Council, the Hyannis Main Street The HyArts Shanties are made possible each season through the generous support of the Massachusetts Cultural Council, the Hyannis Main Street Business Improvement District, the Arts Foundations of Cape Cod, the Cape Cod Chamber, and the Arts Foundation of Cape Cod. While you are visiting Cape Cod, be sure to stop by the harbor and check out some wonderful local art and if you are there during a weekend in May and June, look for Laurie.